What is Independent Custody Visiting? 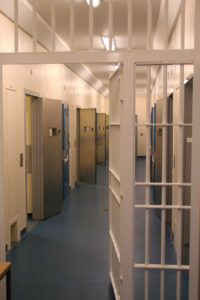 Independent Custody Visiting enables independent members of the local community to visit police stations unannounced to check on the welfare of people in police custody. How does the Custody Visiting Scheme operate? 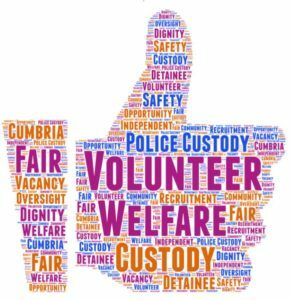 The Cumbria ICV Scheme Handbook sets out the operation of the Scheme and ICVs operate under guidance contained in a national Code of Practice issued by the Home Office. Who are Independent Custody Visitors? Independent Custody Visitors are volunteers who come from many backgrounds and sections of the community. They must be over 18 and either live or work in Cumbria. Serving police officers, special constables and anyone working for Cumbria Constabulary, along with any other people with a direct involvement in the criminal justice system are excluded from the scheme to ensure its independence. The Office of the Police and Crime Commissioner is not allowed to pay Custody Visitors to make visits but expenses are reimbursed. All newly appointed Independent Custody Visitors receive induction training before making any visits. Every year Cumbria holds an annual conference for all visitors and the six Offices of the Police & Crime Commissioner in the North West of England and North Wales hold a regional conference each year which custody visitors from Cumbria can attend. All appointments are for three years and Independent Custody Visitors can serve for a maximum of nine years in the scheme. Vacancies – we are recruiting! When we have vacancies for any of our four panels these will be advertised on our recruitment page. When we are not actively recruiting you can still apply/register your interest using the forms below. With your permission we will hold your application on file until our next recruitment process. Independent Custody Visitors always visit in pairs to make random and unannounced visits to police stations in their area, the timing of visits is a matter entirely for them. On arrival at the police station they should be admitted immediately to the custody area. All visits are conducted under strict rules of confidentiality and detainees do not have to speak to the Independent Custody Visitors. After each visit they submit a report to the Office of the Police & Crime Commissioner. These reports provide an important source of information on the conditions in which detainees are held. This information is analysed and any areas for action are identified. The next reports will be published in early March 2019, following the February panel meetings. ICVA is a national organisation whose objectives include promoting, developing and improving custody visiting. It contains information of interest to anyone regarding custody visiting.